February 22 was when I dropped off of the writing planet. It was a freak accident. I live in a beautiful ski area. I love to ski almost as much as I love to write. That particular day in February was better than most. The snow was good, the weather was warm, I was with friends. It was almost perfect. I skied ahead of my friend. Stopped and turned to watch her ski down. Only when I turned, I fell over. Fell over. Splat. On my face. My hands were still grasping my ski poles and were trapped beneath my body. 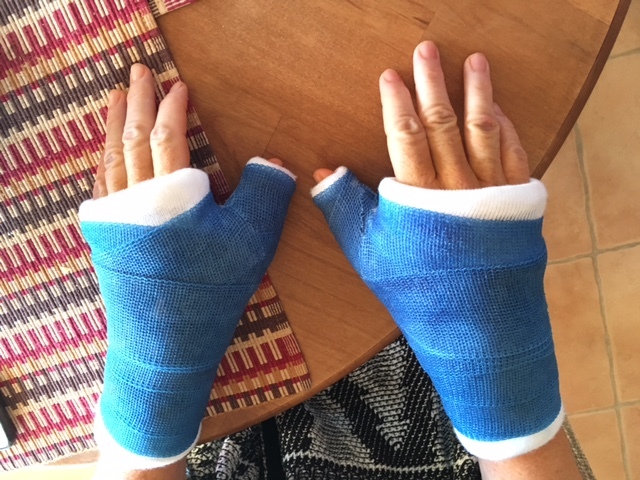 The result was a bloody nose and are you ready…torn ulnar collateral ligaments in each thumb. Basically, both thumbs were hanging limp. Both thumbs had to be repaired with pins. But I’m happy to report, my casts have been removed, physical therapy is complete, and I’m back to writing. Look for Hickville Redemption in the upcoming months! It’s so good to be back in the saddle err back at the keyboard again!